Honesty has always presented a problem for Caroline. 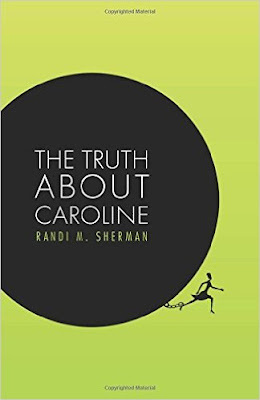 Manipulating situations and navigating around blunders and deceptions have become second nature to Caroline. She could justify every lie she has ever told, and any truth she ever stretched. Honesty and revealing secrets would only keep her from moving forward with her life. What good would it do anyhow? Even all of those bad financial decisions, flawed relationships and questionable life choices seem like child’s play compared to being arrested for the solicitation of her husband’s murder, and what follows. Could someone figure out Caroline? And what would happen if someone did? Please visit CLP Blog Tours for all the tour stops! Sitting in the Human Resource reception area at Morgan’s appliances reminded Caroline of a dentist’s office. The receptionist or as her name placard read, “Executive Assistant,” occasionally looked up, gave Caroline a half-hearted smile and then turned her attention back to her magazine. Pictures of her boyfriend festooned her work area, along with a nearly deflated, Happy Birthday Mylar balloon as it sadly hung in the air, just two feet above the ground. And there was a bowl of hard candy positioned on the corner of the desk, next to the Sign-in Please clip board with its pen attached to it by a piece of yard. Caroline’s stomach was growling, she had skipped breakfast and sat there wondering if the candy was an innocent offering or a test of some sort. If she got up and took a piece of the candy would it be considered too presumptuous? Would the action reveal some character trait that would result in a pass or a fail, rendering the applicant ineligible. The candy, Caroline thought, had probably been sitting there for months, maybe years. Like every grandmother’s coffee table candy dish, the candy in it was probably decades old. Would it be delicious and worth the effort to free it from the cellophane wrapper? Would it be worth the risk? Caroline wondered if other applicants obsessed about that sad, dusty little bowl of candy too. Caroline looked down at her “interview” outfit, hoping that the scotch tape that she had used to hem her pants would hold until the meeting was over. Without much money or time to shop, Caroline grabbed the first affordable interview-type suit she saw at the Women At Work Shoppe in the strip mall near the Super Cuts hair salon where she had her hair dyed and cut in preparation for today’s meeting. She hadn’t bothered to try on the suit in the store. It was navy blue. The suit included a companion blouse and, more importantly, it was on sale. Unfortunately the pants were tailored for a giant. Without a sewing kit or a stapler, Caroline had improvised with transparent tape. When a quiet ring came from the receptionist’s phone, she picked it up, whispered something and glanced at Caroline. “Ms. Pratt,” she announced quietly, “I’ll take you back to see Ms. Herrera now.” As Caroline passed her desk, she took a candy, unwrapped it and popped it in her mouth. “Oh, my mouth is so dry.” She smiled. “Tell me a little about yourself.” Ms. Herrera poised her fingers above the keyboard of her computer, ready to take notes. Realizing that she was enjoying the hard candy a little too much, Caroline discretely spat it into her hand and began her answer. “Well,” glancing at the resume she had on her lap, “as you know I have been self-employed for a while and to tell you the truth,” she was thinking on her feet. “Freelancing is drying up and I am interested in working for a growing corporation where I can apply my skills and experience.” Aced it! She silently congratulated herself. Oh crap! “Oh, um, truthfully Miss Herrera, it seemed like I was never in one place very long. I went where I was needed most.” She was hoping that the answer would be sufficient. “You know missionary work. Move, move, move. I wish I spent more time in the capital.” Caroline’s palms were sweating, the candy started melting.